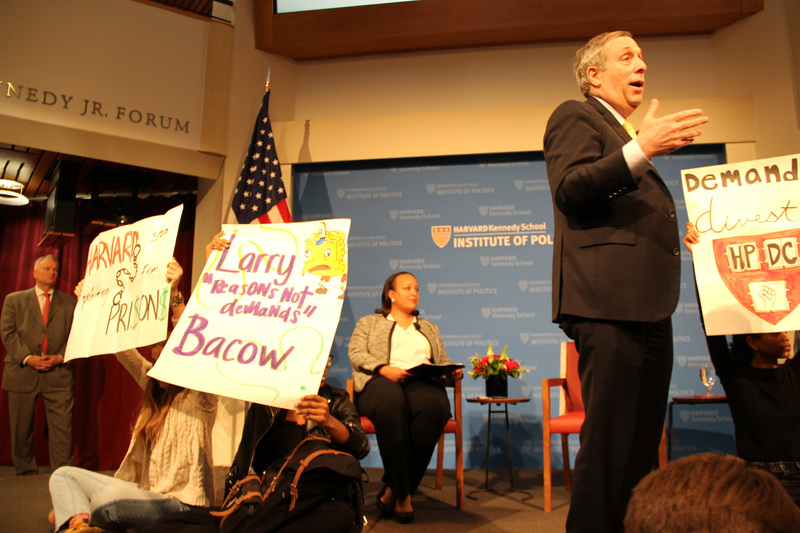 The students of the Harvard Prison Divestment Campaign (HPDC) and Harvard Divest upstaged Harvard President Larry Bacow at the “Conversation with Lawrence S. Bacow” event. The protestors occupied the stage and held up signs to protest the Harvard’s investments in the prison-industrial complex and in the fossil fuel industry. The signs stated slogans such as “Harvard is a leader in profiting from prisons” and “Larry, Lead by Example: Divest from Prisons”. In early March, the students delivered a petition with over 3,400 signatures to President Bacow detailing HPDC’s demand. These demands include to 1) Publicly disclose and release endowment holdings in all funds with stock in companies whose existence depends on the prison-industrial complex, and to 2) Apportion a significant percentage of divested funds towards companies, organizations, and initiatives in Cambridge and Boston that are led by people directly impacted by the prison-industrial complex.